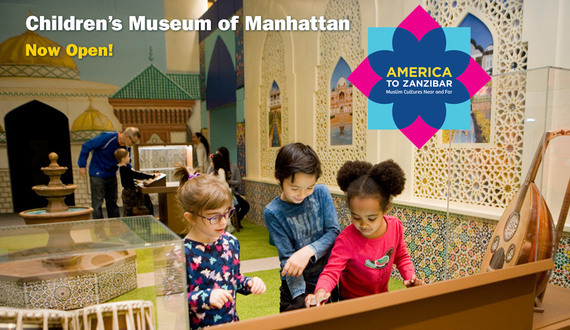 America to Zanzibar is a new exhibit at the Children's Museum of Manhattan designed to highlight the vast diversity of Islamic cultures. Today more than ever, it is of immense importance that we begin to appreciate the complexity and great differences that exist within Muslim societies. Media coverage of Islam is almost always focused on narratives of tragedy and this has prevented many people from having informed exposure to the real diversity among Muslims. America to Zanzibar shines a light on the rich intellectual and cultural history that stands behind this world civilization. Architect Maryam Eskandari and her team of designers from MIIM Designs began the project by asking themselves, "How do you represent 1.7 billion people in 3000 squared feet?" 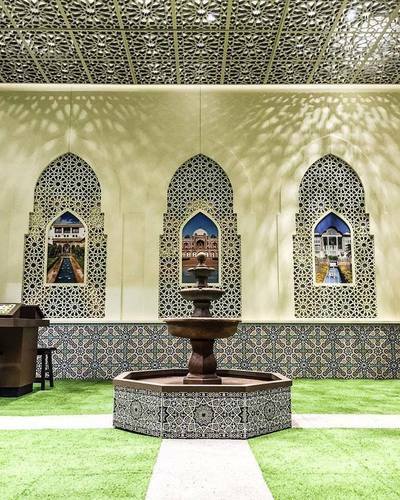 What they came up with is an exhibit that highlights universal Islamic principles while showcasing the immense plurality of Islamic cultural expression. Through images, architectural structures, and creative activities, America to Zanzibar (#AtoZNYC) asserts that Muslims differ not only in the ways they interpret religious ideas but also with respect to how they express their Muslim identity in the architecture and design of cities and homes, the ambience of markets, and the aesthetics of Islamic fine art, music, and crafts. NYC Children’s Museum Celebrates Muslim Diversity from MIIM Designs on Vimeo. For instance, upon entering the exhibit, the visitor walks into a green courtyard or chaharbagh, a universal Islamic symbol of the heavens and the human soul in a state of harmony. At the center of the garden is a fountain, which is symbolic of several Islamic beliefs - the purifying function of water and the role of prayer in bringing peace to the human heart. Through the interactive experience of placing "drops of hope" - short wishes or prayers - into the fountain, visitors learn about the role of personal prayer in connecting the heart to the Divine. Eskandari says they have already received the most beautiful "drops of hope," such as, "I want my mommy to get better" and "I want my family together again." These wishes themselves express one of the most essential Islamic beliefs - the importance of unity. For Muslims, the monotheistic assertion of God's oneness is also the basis for a social and spiritual ethic that encourages the creation of peace and unification between people. The "American Home" area allows visitors to experience a typical American Muslim household. Bookshelves filled with books from many cultures, including the Qur'an, calligraphy on the walls, candles and décor, provide a window for visitors into the household aesthetic of American Muslim design. Prayer carpets remind visitors of the five daily prayers (Salat) performed by Muslims, and the types of spaces created in the home for this spiritual activity. At the household table, children can write their name in up to 20 different languages - another assertion of the plurality of Islamic identities even within America! In other areas of the exhibit, patrons can see up to fifty different styles of Islamic carpets, the variance among mashrabiyyas (patterns used in carved lattice screens), and the immense difference between the design of mosques in several countries. 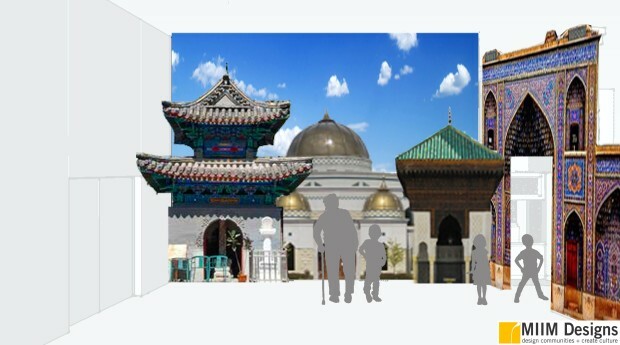 While most associate the mosque with a typical green minaret, examples from mosques in China that do not display a minaret confirm the central role played by geographic region and culture in defining the norms of Islamic architecture. Some of the most famous examples of Islamic architecture are displayed in juxtaposition, highlighting the defining stylistic features that make, for example, the Alhambra in Spain distinct from the Nasir al-Mulk Mosque in Shiraz, Iran or Homayun's Tomb in New Delhi, India. Here we see how the varying use of shapes and colours in architecture reflects the local culture, symbols from nature in the region, and the needs of daily life. In the Bazaar Turkish tiles are showcased alongside tile-work from Senegal, and Egypt. Visitors can go "fishing" in Zambia, before visiting the spice market of Egypt and the fruit market of Indonesia. 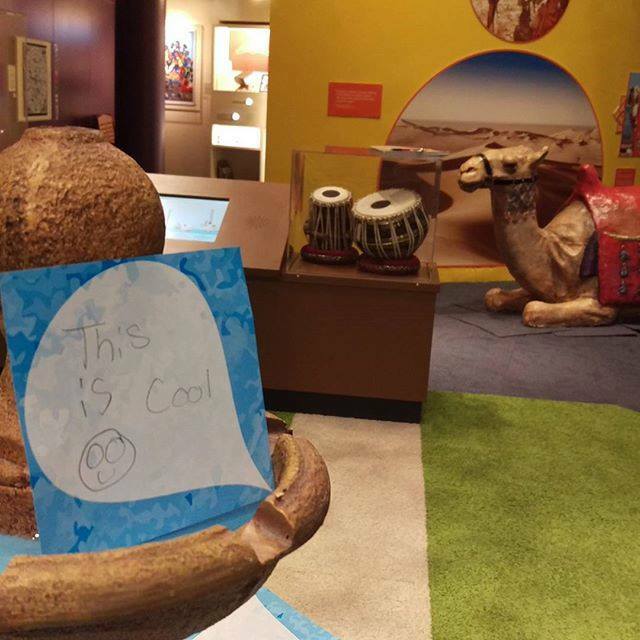 Greeted by music from the Silk Road, the exhibit's final area is dedicated to music. 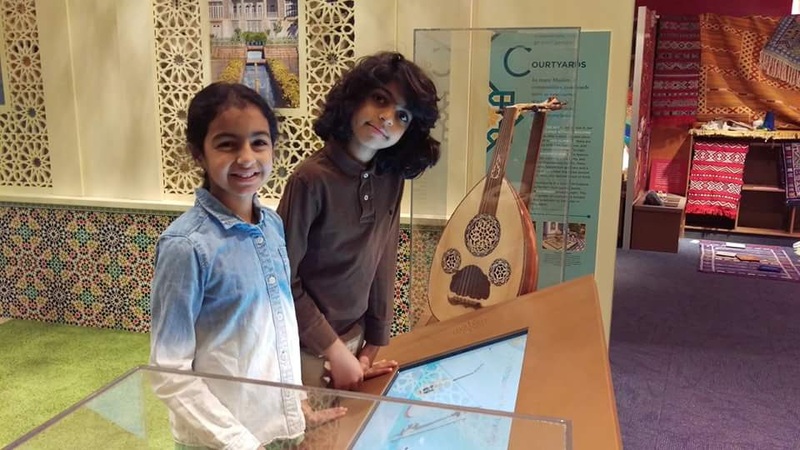 Traditional Islamic instruments like the oud, tanbour, tabla, and sitar are displayed and through a digital activity, children can use the instruments to compose their own songs. Famous Muslim musicians from Americans Lupe Fiasco and Mos Def to the Malaysian singer Yuna are also on full display, representing the many genres of Music that have been influenced by Muslim artists. While no single representation could capture the essence of 1.7 billion individuals, this exhibit demonstrates that "Islamic" means very different things around the world. By sharing with the viewer an appreciation for the real differences that exist between Islamic cultures, America to Zanzibar affirms a timely message - Muslims are not all the same! Their cultures, style, and daily activities differ as much from each other as they do from non-Muslims. At the same time, they are all inspired by a common core of Islamic symbols and beliefs. America to Zanzibar's visual beauty and interactive qualities provide children and adult visitors with a tangible experience of Islamic diversity that will certainly expand our imaginations of "the Islamic." For this reason, it is a timely contribution to our collective experience of the Islamic world and an important reminder of the diversity here at home among American Muslims. Images credited to: Children's Museum of Manhattan, Vladmir Baron, MIIM Designs, Hussein Rashid.